Wal-Mart announced Monday that, beginning tomorrow, it will sell the 16GB Apple iPhone 3GS for $97 with a two-year contract--that's a $100 cut from its current price at Wal-Mart, and a $102 cut from the current price at the Apple store. This announcement comes just a couple of weeks before Apple's 2010 Worldwide Developer's Conference (WWDC), the annual event at which Steve Jobs typically announces the newest iPhone model. Presumably, Wal-Mart is anticipating that Apple will not only announce a new iPhone (one that we've already seen), but that Apple will also cut the price of the iPhone 3GS to $99 once the iPhone 4G hits the shelves. 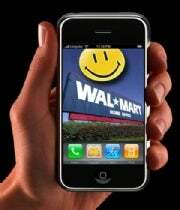 A spokeswoman for Wal-Mart informed the Wall Street Journal that Wal-mart "intends to lead on market price." Since Wal-Mart currently sells the iPhone 3GS for $197, or $2 less than Apple's $199, it would appear that Wal-Mart thinks Apple is going to do the same thing it did last year--slash the price of the old model by $100 (Apple's iPhone 3G currently sells for $99 with a two-year contract) when the new model comes out. Meanwhile, Boy Genius reports that Apple has stopped shipping the 8GB iPhone 3G to AT&T stores, and that orders are no longer being placed for the phone. The report suggests that this might be Apple paving the way for the iPhone 3GS to drop to $99 when the new model is announced, but is "not sure" and simply notes that "we're about to find out." To make a long story short: Everyone and their mother (myself and my mother included) believes that Apple is going to unveil the iPhone 4G on June 7, 2010, and Wal-Mart just happens to have a little bit of foresight. You can start picking up your half-price iPhone 3GS's tomorrow at your local Wal-Mart storesipho.